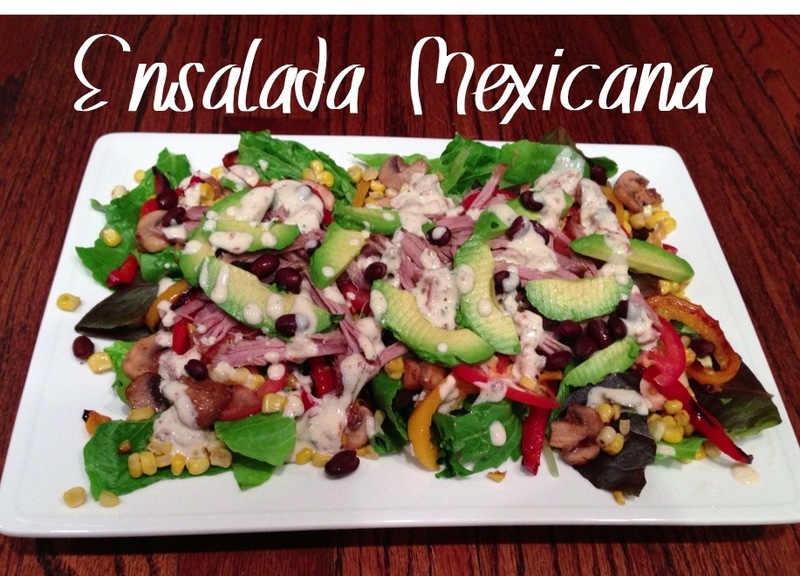 ensalada mexicana | Is there any wine left? It’s funny how your tastes change as you get older. Maybe I mean preferences instead of tastes. I guess I’m not really talking about whether or not something tastes good, but instead what I want to eat for a meal. For instance, I learned to eat salads about 10 years ago and I actually like the taste of most of them, but I have never preferred having salad for dinner until about a year ago. Anyway, its not a regular occurrence but every now and then I enjoy having a big salad for dinner. This one, topped with fried pork and chipotle Ranch dressing, is one such example. Obviously I’m pretty much the picture of health, friends. In a food processor, grind the chipotle chiles to a paste. Remove to a bowl and mix with the Ranch dressing packet, buttermilk and Greek yogurt. Whisk until smooth then refrigerate until ready to use. Tear the Romaine lettuce and mixed greens into bite-sized pieces. Rinse and dry. Place in a large bowl and set aside. In a large skillet, heat 1 tbsp. olive oil. Sauté the corn, bell peppers and mushrooms until softened and slightly caramelized. Remove from heat. To layer the salad, make a bed of Romaine lettuce and mixed greens. Top with the corn, bell peppers, mushrooms, black beans, avocados and meat. Drizzle with the chipotle ranch dressing and sprinkle with cilantro.